Genetic modifiers. Dravet Syndrome, formerly Severe Myoclonic Epilepsy of Infancy (SMEI) is a severe epileptic encephalopathy starting in the first year of life. More than 80% of cases of Dravet Syndrome are caused by loss-of-functions mutations in SCN1A, a voltage-gated sodium channel predominantly expressed on GABAergic interneurons. Now, a recent paper in Neurobiological Disorders investigates the role of CACNA1A variants as possible genetic modifiers in Dravet Syndrome. Variability in Dravet Syndrome. Dravet Syndrome is a monogenic epilepsy due to mutations in the SCN1A gene. Most variants associated with Dravet Syndrome are loss-of-function mutations, which are spread throughout the SCN1A gene. Milder mutations in SCN1A may cause Genetic Epilepsy with Febrile Seizures Plus (GEFS+), but within the more severe mutations leading to Dravet Syndrome, there is little genotype/phenotype correlation. Even though Dravet Syndrome is a recognisable epilepsy syndrome, there is some variability within the epilepsy phenotype and neurodevelopmental comorbities. For example, a recent publication by Brunklaus and colleagues in Brain investigated the outcome of 241 patients with Dravet Syndrome with SCN1A mutations. They found that up to 20% of patients with Dravet Syndrome who do not have status epilepticus have a better outcome, while patients with earlier interictal abnormalities on EEG have a worse outcome. In total, the authors list up to 30 clinical features that may be variable in patients with Dravet Syndrome. The type of SCN1A mutation does not seem to matter much, so what determines the variability of these features? Vaccinations and environmental modifiers. Phenotypic variability can be due to genetic factors, environmental factors, the interaction of both, or simply due to chance. There is no evidence for a role of environmental factors in modifying the phenotype of Dravet Syndrome. Despite a longstanding debate on the role of vaccinations in patients with Dravet Syndrome, there is little evidence that seizures in the context of vaccinations in patients with Dravet Syndrome may be related to a more severe outcome. Even though many children with Dravet Syndrome have their first seizures in the context of vaccinations, this does not affect the overall outcome. Genetic modifiers. The issue of genetic modifiers in Dravet Syndrome is more complex, and two lines of arguments are frequently invoked to support the role of additional genetic factors. These include a familial clustering of febrile seizures and the role of identified modifier genes. As both arguments have their own pitfalls, it is best review the existing evidence separately. Febrile Seizures in family members. Ever since the first description of Dravet Syndrome by Charlotte Dravet, a certain clustering of Febrile Seizures in relatives of patients with Febrile Seizures has been observed. Such clustering may be due to the additional genetic factors predisposing to fever-related seizures or through mosaic SCN1A variants in parents resulting in a milder phenotype. Whatever the genetic basis of this phenomenon may be, is this clustering actually meaningful? It depends on whether this clustering is suggestive of familial aggregation. In a 2005 review in The(?) Lancet, Burton and collaborators distinguished between clustering (the observation of several cases per family) and familial aggregation (an epidemiological concept). Febrile Seizures are present in up to 5% of children, and the frequency of Febrile Seizures in relatives of patients with Dravet Syndrome would need to be compared against this baseline. 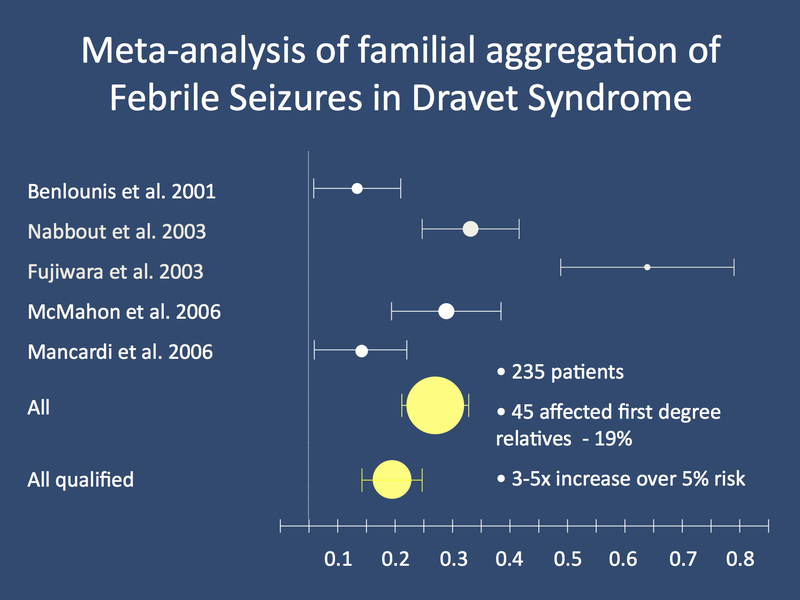 If there is evidence that the frequency of Febrile Seizures in relatives of patients with Dravet Syndrome exceeds the frequency of Febrile Seizures in the general population, familial aggregation will be present. Unfortunately, many publications only report the frequency in relatives of patients without referring to the frequency in controls or the group of relatives investigated. This information is usually not sufficient to establish familial aggregation. In publications like the study by Mancardi and collaborators, which explicitly compare frequencies of Febrile Seizures in relatives to controls, no evidence for familial aggregation can be identified. However, most of these studies are small and may not detect a small degree of familial aggregation that is consistent with familial aggregation in other complex genetic traits. Therefore, as of 2012, there is no conclusive evidence for or against the role of additional genetic factors in Dravet Syndrome from an epidemiological perspective. Either way, the frequency of Febrile Seizures in relatives cannot be used to support the role of modifier genes in Dravet Syndrome. Meta-analysis of the frequency of Febrile Seizures and Epilepsy in first degree relatives of patients with Dravet Syndrome and mutations in SCN1A. Studies were subdivided into studies reporting the frequency in first degree relatives vs. all relatives. In summary, the current data suggests a frequency of Febrile Seizures or Epilepsy in 10-15% of patients with Dravet Syndrome, a finding suggestive of familial aggregation when compared to an estimated population frequency of 5% or lower. However, few studies have included control data. The role of modifier genes. Another strategy to look at the role of genetic modifiers is to look at the possible candidate genes directly by sequencing. It should be noted, though, that these findings would need to “stand on their own feet”, i.e. results would need to be sufficiently robust statistically. There is some evidence from mouse models suggesting that SCN8A might counteract the deleterious effect of SCN1A mutations, but a role for SCN8A variants in humans has not yet been established. Also, SCN9A variants have been suggested as genetic modifiers in Dravet Syndrome. In the current study by Ohmori and collaborators, the authors investigate variants in CACNA1A, a voltage-gated calcium channel. CACNA1A mutations may lead to episodic ataxia, familial hemiplegic migraine and spinocerebellar ataxia type 6. A role of CACNA1A in epilepsy has been suggested based on observations in a mouse model (the totteringmouse) and patients with de novo CACNA1A mutations. CACNA1A variants in Dravet Syndrome. The authors sequenced the entire coding region of the CACNA1A gene and identified nine common and rare non-synonymous variants. All variants were inherited from parents and – with the exception of a single variant – present in controls. Functional analysis suggested that most of the variants identified resulted in a gain of function of the CACNA1A protein. The frequency of CACNA1A variants was not different in patients and in controls. The authors then proceeded to analyse the association with clinical features of the patients with Dravet Syndrome. They found that all 8 patients with absence seizures had additional CACNA1A variants and that patients with CACNA1A variants tended to have earlier and more severe seizures. If correction for multiple testing is applied, the findings are not significant. What does this mean? CACNA1A is a good candidate for a modifier gene in Dravet Syndrome and the finding that all patients with (atypical) absences have possibly functional variants in CACNA1A deserves notice. As the authors compare the frequency of several variants across several subphenotypes, a multiple testing problem comes up. In comparable studies, it might be worthwhile to distinguish between common genetic variants and rare variants, which require different statistical tests. For common variants, a clear-cut “yes or no” finding is unlikely, as these variants probably do not confer a strong genetic risk. For rare variants, however, summary statistics might be worthwhile to assess the cumulative effect of deleterious variants. Either way, the current study generates the hypothesis that variants in CACNA1A may be associated with atypical absence seizures in patients with Dravet Syndrome, a hypothesis that can easily be tested in future studies. This entry was posted in 2012, Epileptic encephalopathy, EuroEPINOMICS, Familial epilepsies, Opinion, Papers and tagged CACNA1A, Dravet Syndrome, epileptic encephalopathy, febrile seizures, GEFS+, genetic epidemiology, genetic modifiers, myoclonic epilepsy, neurobiological disorders, science, SCN1A. Bookmark the permalink.